Elections are still a year away when the rumors are heated. Nandyal and Allagadda constituencies will now become a challenge to the TDP. In Nandyal and Allagadda constituencies, as in the Telugu Desam Party, the strikes are going to the top. The disagreements between the two leaders in the constituency of these constituencies have already taken root. They are openly challenging. They are not both .. Minister Akhila Priya, TDP leader AV Subbareddy. Both of them were tough to come up to date. Bhuma Nagi Reddy was a key supporter of him when he was alive. Subba Reddy has no evidence to prove that the party's removal is no longer possible. In Nandyal and Allagadda constituencies, the Bhuma faction appears to have a big impact on the polls. Nandyal MP SCY Reddy wanted to give this seat for the first time, and Subba Reddy has already sent signals to the top of the ticket. None of the Subba Reddy's recent developments say that there is a significant response to the helpline. His followers say that the helpline has been set up against the government of Bhua Akhilpriya and is more than 100 calls a day. Though Bhuma Nagi Reddy is the MLA, they are reminded that Subba Reddy is only available to the followers and the people. It is also said that none of the men in the house still act in Allagadda. 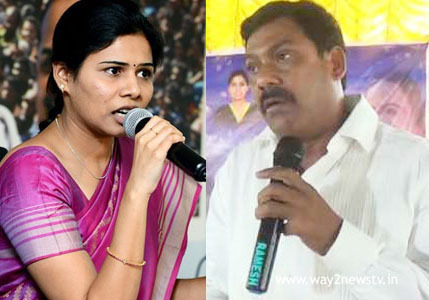 AKhila Priya does not seem to be in the case of Subba Reddy. All that is unclear of all, he decided to keep him away. It is said that the chief minister had already explained to Chandrababu and Minister Lokesh on the plot against him. Minister Lokesh has also spoken to the In-Charge Minister Kalva Srinivasulu. However, Kalwa is not the reason for the dismissal of the two and the Chief Minister also wanted to intervene. In TV channels in Nandyala and Allagadda constituencies, they are now in the midst of the duo. This business seems to be in the hands of the Bhuma and AV. Subba Reddy has been reported to have been in the local news of the cable TV now without all the reference to Akhilapriya. But the news of the Nandyala MLA Bhuma Brahmananda Reddy is news but not all of the cable TV has been informed. In this case, the minister is becoming unbelievable. Already all and no Subba Reddy publicly reprimanded the situation. There are more possibilities for this. There are also two other sources that have been agitating for farmers at Yard. Also the cable war has started. Subba Reddy made a decision to notify the Minister of All India Telecom in Nandyala City Cable. However, the cable owner has been asked why the minister will not air his news. She also reminded me of the cable. But the cable owner suggested that none should talk to Subba Reddy if anything. The politics of Nandyala went to the riverbed. However, none of Subba Reddy and Akhila Priya will meet with Chandrababu and after a while. Minister Kalva Srinivasulu took them to Chandrababu. And let's see if the controversy still ends.